January 27 to February 2 is the 45th annual National Catholic Schools Week. Washington's one hundred Catholic grade schools and high schools will celebrate with a special Mass, community service projects, and other events throughout the week. Additionally, many of these schools will participate in a special Catholic Schools Day in Olympia on Wednesday, January 30, to meet with key legislators and other state officials. Read more. Archbishop J. Peter Sartain celebrating Mass at St. Michael Church said, "You and I are here because we believe that we will be judged on how we treat the most innocent and most vulnerable - the unborn, the frail elderly, the disabled, the terminally ill, the foreigner." Auxiliary Bishop Daniel Mueggenborg, celebrating Mass at Sacred Heart Church in Lacey, thanked the overflow crowd for being there "to make your presence known, to make your voices heard, to make your faith visible and to take a stand as the body of Christ, protecting and promoting human life this day." See more photos and the full story in Northwest Catholic - Read more. 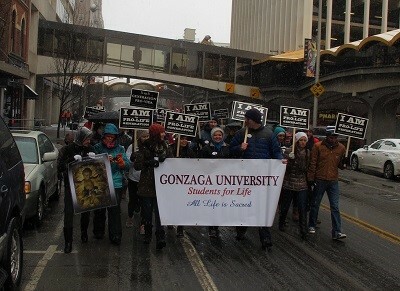 Spokane Marchers Faced Snow - for photos of the Northwest Walk for Life in Spokane. Read more. Catholic Charities and other religious organizations have been longtime partners with state and local governments in trying to reduce homelessness by building affordable housing. Safe and stable housing is a basic human need - essential to a person's well-being in all aspects. SB 5358 allows religious organizations to enhance their mission to provide affordable housing. The Senate Housing Stability & Affordability Committee will hear the bill on January 30 at 1:30 pm. The companion bill in the House, HB 1377, will be heard by the House Housing, Community Development & Veterans Committee on Friday, February 1 at 10:00 am. On January 20, Cardinal Daniel DiNardo, of Houston, Texas, USCCB President and Bishop Joe S. Vásquez, of Austin, Texas, Chair of USCCB Committee on Migration, urged the President and lawmakers to end the federal government shutdown: "Political leaders must come together to ensure a bipartisan solution is reached which recognizes the economic struggle that many families are facing including those dependent on federal workers and those assisted by critical nutrition and housing programs." Read more. Did you know that over 1200 bills have already been filed in the Legislature this session? Fortunately, people participating in Catholic Advocacy Day will be focused on five key legislative issues: (1) community-based mental health, (2) increasing funding for the Housing & Essential Needs program; (3) additional funding for the Housing Trust Fund; (4) repeal of the death penalty; and (5) protecting the life and dignity of each human person. Join us Thursday February 7, 2019, and make your voice count for the common good in this crucial legislative session! Details and registration.